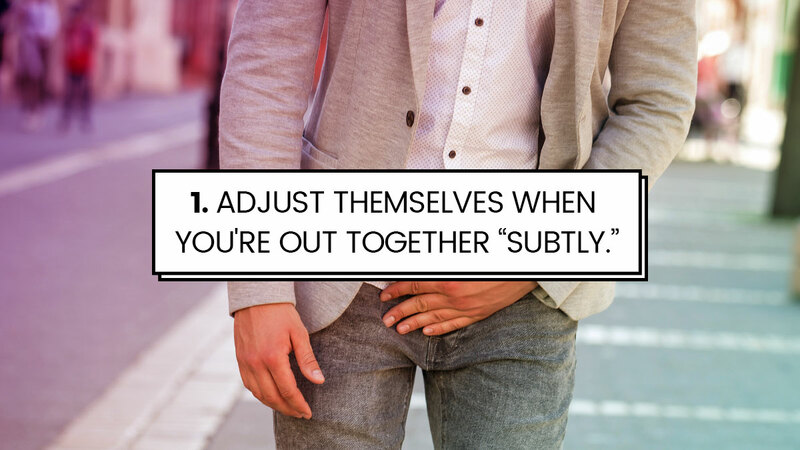 Adjust themselves when you're out together "subtly." The trouble is, it's never subtle. Ever. Someone definitely noticed him do it and probably assumed he was jerking himself off through his pocket. He's sorry in advance, it just needs to be done. The only good male dancers are the ones who do it professionally. Just lean into the goofy dancing when you're at weddings together. You'll be fine. This is the great equalizer. No matter how polite or refined, every man has inadvertently peed on the seat at least once. Even Barack Obama has woken up groggily for a midnight pee and missed the bowl in a daze. And then company came over and saw it and Michelle was annoyed. It happens to everyone. This is one that's being included begrudgingly, for the record. But it's pretty common for boyfriends to not have the fashion sense their girlfriend's wish they had. Apparently, jeans and a button-down just don't cut it. Act like idiots in front of their friends. EVERYONE has that friend or group of friends that they get into a groove with. The kind of groove that looks insane to anyone on the outside of it. It's a good thing, really, to have friends like that. It just might be embarrassing when they start cracking jokes and acting like they're 12 again. Try to rap or sing along to songs they have no business attempting. It's a rude awakening when we discover you are not impressed by our car karaoke performance of "Look at Me." Whether they're attempting to impress you while they help you move, or just taking an ill-advised bet, most guys have pulled something while "challenging" themselves physically. You know when your boyfriend meets a new guy he doesn't know and his voice and posture change all of the sudden? That’s "bro mode" and it's his way of sizing up other dudes. Yes, he knows it doesn't fool you. He will learn all too late in life that no, this is not "manly" behavior. Do their best to embarrass you in front of your friends. Part of a boyfriend’s duties are to embarrass you in public. But in a cute "omg stoppp" kind of way. Not a "someone called the police and everyone else is recording this meltdown for YouTube" kind of way.